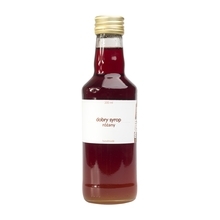 Dobry Syrop translates as Good Syrup - a wide choice of fully natural, fresh and delicious syrups from Poland. Perfect for milky coffees, cakes, ice cream and pancakes. The variety of flavours ensures that every gourmand will find something to his or her liking. 200 ml 500 ml Sort by: Price (Low to High) Price (High to Low) Product name a - z Product name z - a Highest rate Lowest rate New in!